« Greasborough, Methley Perseverance, Rotherham County & then one of our greatest ever players. The winter of 1923. A settled Arsenal and the victories finally start coming. In December 1922 Arsenal had opened the month with a defeat, making it no wins, two draws and six defeats in the last eight games the club had played. But after the final defeat in the sequence the rest of the month had turned out rather well. The subsequent run of three wins, two defeats and a draw was hardly earth shattering, especially as in each of the defeats Arsenal had conceded four goals. But it was an improvement, and an improvement that was most certainly needed. As a result the club could look forward to 1923 with a little more hope – and indeed the hope was fulfilled, not just for Arsenal but also to some degree for football and the wider world. For this was the year that the national game took a step forward by having its own stadium which would host the FA Cup final each year. That stadium was of course Wembley, but as we shall see later in these articles the first final held there, in this year of 1923, was a bit of a shambles. However if you can’t wait, here’s the Pathe news broadcast of the occasion. 1 January 1923 was in itself quite a day since it was the moment at which the large number of small railway companies that had independently divided up England during the boom years of railway building, were now merged (not least through a need to raise significant sums to maintain and develop their lines) into four main companies. That £1868 is equivalent to £86,000 today taking into account general inflation, but land prices in London have risen far ahead of general inflation. If we take the rise in land prices in London into account we would have the price of that plot of land at around £150,000. These offers to buy land and buy out the lease show two things: first we see the success Sir Henry had had in reducing the Arsenal debt that had resulted from developing Highbury, and second his confidence in the club going forwards. Now this was particularly interesting for as we have seen, since the re-start of football after the First World War, Arsenal had been lurking near the foot of the first division table, often in danger of relegation (although each time they had escaped at the last). And yet despite this, Sir Henry was ready to commit more money to the long term future of the club. It is also interesting that this comes at a time when Leslie Knighton, the manager of the day, claimed in his autobiography (written 23 years later) that his abject failure as a manager at Arsenal was down to Sir Henry Norris’ decision to forbid any transfers costing over £1000. And we have seen that a number of players did join the club for over £1000, so Knighton’s assertion looks like trying to pass the blame for his failure as a manager on to the owner. But now we can also bring in these other factors. Clearly transfer fees were rising, and we have seen in previous episodes just how rapidly the debt was declining. All things combined it seems ever more likely that Knighton is not to be believed over restrictions on transfer fees. It simply makes no sense. But also, we must remember that this show of financial strength might also have come from two other thoughts. These thoughts are contradictory, and we can’t know which route Sir Henry’s mind was travelling at this time, but it seems from such information that we have that he was moving down one of this two roads. First, having ended his career in politics at both the local and national level, and having broken all his ties with the Borough of Fulham, where he had been engaged in many meetings and campaigns over the years, he might well have seen Arsenal as his prime “occupation” now, and so wanted to push the club forward. Second and contrary to this it is possible that Sir Henry was seeing the end of his engagement with Arsenal, and feeling that his job would be done if he secured the extra land, recovered all the money he had loaned the club, secured its position in the first division, gave the club its own land, and then pulled out. In favour of this view is the fact that having had what was clearly a very serious illness he had purchased a property in the south of France where he must have felt the climate was more helpful to his chances of long term survival and the enjoyment of his retirement. But also it is possible that he was particularly moved by the long illness of Lord Kinnaird – completing his work at Arsenal and then heading to permanent retirement in the south of France might well have seemed the best way forwards from the point on. So, let us return to the opening months of 1923, and we find that on the 1st day of the year Arsenal secured a 5-0 win away to Blackburn. Boreham was injured and Robson took his place; but otherwise the team remained the same. And this win meant that after one win in 12 in the league, Arsenal had now won three in a row, scoring 13 goals and conceding nil in the process! Even more excitingly for the club Turnbull scored four to make it a staggering nine goals in three games. After the match Arsenal found themselves two places higher in 17th, and with a now considerably improved goal average. True, all the clubs below them had games in hand, but the gap to 21st was now five points and Arsenal had a better goal average, with Oldham now having just one game in hand. The following weekend on 6 January Arsenal were away to Stoke who as we have seen were bottom of the League. With Arsenal in their fine form this surely meant an away win, but of course this was Arsenal under Knighton and the unexpected always happened. Boreham returned and Graham replaced Butler at centre half, but otherwise the team was the same… and they lost 0-1. The following Monday 8 January, Sir Henry attended the quarterly meeting of the Feltmakers’ Company – showing that although he had given up most of his public duties this was one area that he was not going to step down from. For the next game in the 1st round of the Cup (the equivalent to the 3rd round in current parlance) Arsenal were drawn away to Liverpool, and Sally Davis has an interesting tale to tell about this match suggesting that Dr Paterson (who had played in the last four matches thus undoubtedly contributing to Arsenal’s success), missed the train to Liverpool. Liverpool were striding away at the top of the League as we have seen, with Sunderland their only realistic rivals, and so the away draw achieved on this day was no mean feat for a team that just one month before had been odds-on favourites for relegation. But the replay held the following Wednesday, 17 January, was not such a balanced affair as Arsenal lost 1-4 at Highbury. In a most interesting comment in the Islington Gazette Arthur Bourke stated that Arsenal’s forwards had displayed “a want of finish,” suggesting this was their normal style. 13 goals in three games ending just three weeks before were already forgotten, and the question now was, was it back to the old ways of multiple defeats and no goals scored? Everyone had a chance to find out on 20 January when Arsenal played Manchester City at home – their first home league game since beating Stoke 3-0 on 30 December. City were in a pack of clubs chasing third position in the league (not that there was any prize for coming third of course), and this made them look nearly as strong a challenge as Liverpool. McKenzie came in at inside left to replace Boreham once again and otherwise the team was the same as before and Arsenal won 1-0 to make it four wins out of five league games. The return match with Man City was the following week when the clubs played out a goalless draw, with Arsenal utilising the same team as the week before – something that would have been unthinkable at any time previous to this in Knighton’s regime. That made it four wins one draw and one defeat in the last six league games. It also made it three points from two games against City. Of course this sort of upturn was difficult for the newspapers to report, since the standard approach was one of remorseless criticism. So a new tack was found: stories about discontent among the players who had been replaced as the season went on. The ever adaptable Blyth was the only member of the opening XI to play in this game – which given that the opening XI had only secured one win in the first five games was probably quite reasonable. But while Arsenal were getting their point in Manchester, Arsenal’s London Combination side, it was noted, was made up largely of the players who had started out in the first team back in August. One could almost hear the press rubbing hands together with glee. They had found another story. But now to turn away from Arsenal for a moment, if you have been following this tale through all its twists and turns, you will recall mention of Lord Kinnaird and how in 1920 Sir Henry Norris had become chairman of the property company that his lordship had founded. 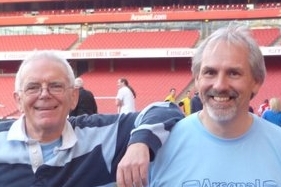 The two men linked together by a lifelong passion for football – his lordship having helped found Old Etonians FC, previously having played for The Wanderers, and having played in nine early cup finals. He became the first president of the FA. So here we find the reason for the lack of activity in the property company. Not only had Sir Henry been ill and away recuperating in Europe, but so had Lord Kinnaird and on 30 January he passed away after a long illness. But also we must notice Lord Kinnaird was one of the members of the governing body of St John’s College Highbury, on whose land Arsenal FC had built its ground. The connections that linked the two men were indeed multiple. Sir Henry Norris and William Hall would naturally have attended the memorial service for Lord Kinnaird on 1 February at St Martin-in-the-Fields. William Hall went to it, officially representing the Football League. Arsenal had used just 13 players in the four league matches in January, compared to 17 players in the four games in November. It was quite a change. Looking forward, Arsenal’s aim for February must have been more of the same, both in terms of keeping the team together and continuing the push up the league, although yet again, those extra games played meant that this was going to be hard. All four teams either on the same points as Arsenal or with one point more, had at least one game in hand. A realistic aim therefore must have been to have a February that was similar to January in the league – two wins, one draw and one defeat was a fair target while keeping the turnover in the squad down to a minimum. If that was mentioned then the first match would have been a disappointed – a 2-1 away defeat to Nottingham Forest (who we may remember put in a bid to join the First Division in 1919, Forest coming bottom of the poll as Arsenal came out top). Baker got the goal which may have convinced the manager to move him from outside right to inside left for the next match, with Ruterhford now returning from injury with McKenzie making way. If that was the thinking the it certainly worked as on 10 February in the return game at Highbury Baker got both goals in a 2-0 victory. One win and one defeat in the month. Meanwhile, in a very different area of activity, on 16 February archaeologist Howard Carter finally unsealed the burial chamber of Tutankhamun, a Pharaoh of the Eighteenth Dynasty of Egypt. The following day was played one of the four biggest Arsenal games of the season – away to Chelsea, and in front of 50,000 the clubs played out a 0-0 draw. One week on from there on 24 February Arsenal got their revenge with a 3-1 over the Blues with Baker scoring again, Blyth getting two. For Baker it meant four goals in four games, while for Arsenal the results were indeed as per January in the league with two wins one draw and one defeat. Arsenal had once again just used 13 players in four games. Continuing the theme of the stability of the squad, taking the games of January and February, Robson, Mackie, Kennedy, Milne, John, Turnbull, Baker and Paterson played in all of them while Blyth only missed one game. It made a very solid side. Arsenal could, perhaps for the first time, start looking up the table with a sense of wanting to finish as high as possible up the League rather than looking down with worries about relegation. Even if Birmingham won their two games in hand they would still be four points behind Arsenal, and that was a fair margin of safety. At last.